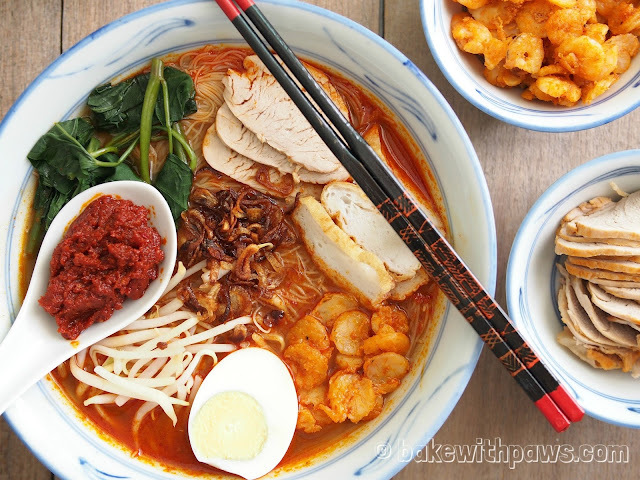 Penang Prawn Mee or we call it Hokkien Mee in Penang. I have been trying to cook this for as it is one of my hubby’s favourites. I finally collected enough prawn shells for it. I must admit that it is a very time consuming endeavour. Having it at a hawker store is well worth it! A strip of pork lean meat (about 300g to 400g), boiled and sliced. 1. Blanch pork ribs and big bones in boiling water for about 5 minutes. Drain and discard the water. 2. In a big pot, add pork bones, seng kuang and water. Simmer for about one hour. 3. In the meantime, remove prawn shell and keep the prawn meat aside. 4. In a wok, heat up 3 tbsp of cooking and fry all the prawn shell until aromatic or turn to golden orange. Blend the prawn shell with some water in the blender. 5. By this time, it is almost one hour. 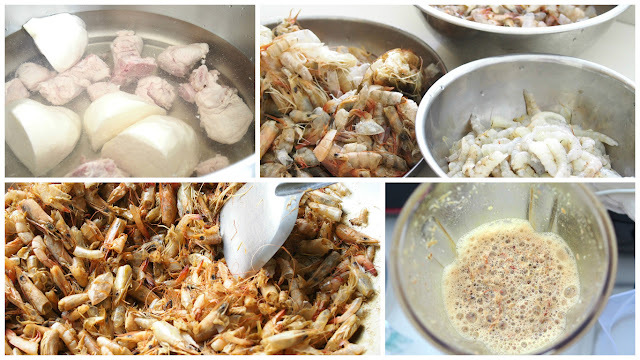 Add the blended prawn shell into the stock and simmer for another two hours. 6. Strain the stock. Discard the prawn shell and Seng Kuan. Return pork bones to stock. Add the strip lean meat in the stock and boil for around 15 minutes. Remove lean meat and set aside for topping. 7. Season with rock sugar and salt and add half of the spice paste (prepared as below) or according on how spicy you like. 8. The stock is ready. 1. 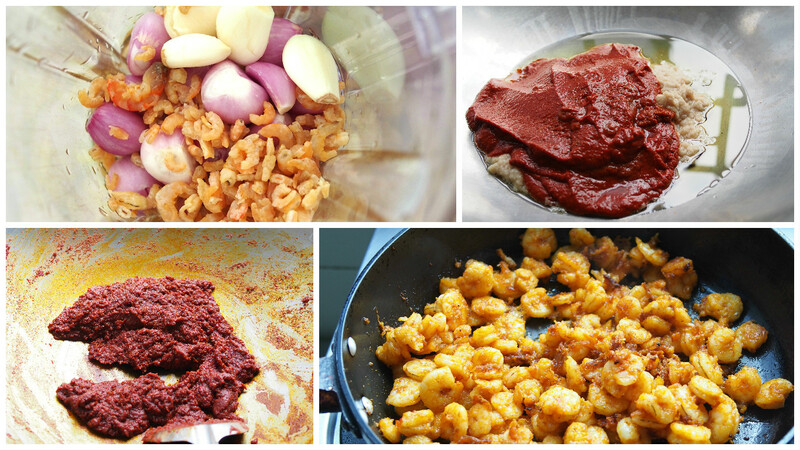 Blend all the spice paste ingredients except oil and chillie boh in the blender with some water. 1. Blanch the prawn meat in the boiling stock with a strainer. 3. Slice the prawn in half horizontally and set aside. 1. 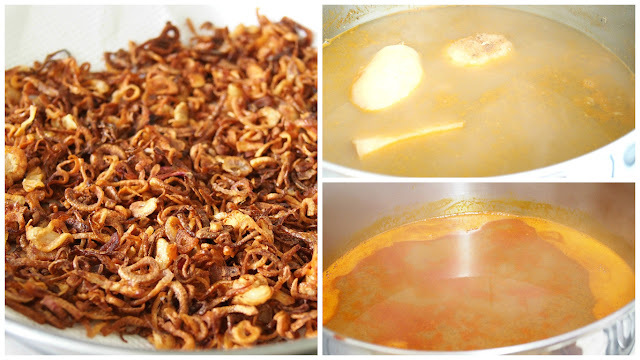 Heat up ½ cups of cooking oil a wok and fry the sliced shallot until crispy and golden brown. 2. Transfer the shallots to a plate lined with paper towel to drain. Keep in airtight container once it cools completely. 3. Blanch Rice vermicelli, kangkong and bean sprout separately in boiling water. 4. To serve – In a serving bowl, place rice vermicelli and add the boiling stock. 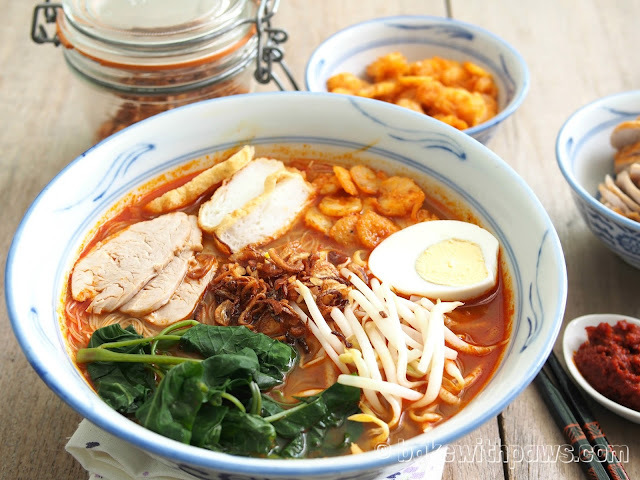 Top with bean sprout, kangkong, hard-boiled egg, sliced fish cake, fried slice prawns and slices of lean meat. Garnish with crispy shallots and serve with chillie spice paste if you like more spicy.